Everyone coming to the Pantanal for the first time has a lot of doubts about what photo equipment they should bring. So here’s my opinion as a guide and photographer that has been shooting in the Pantanal for over 15 years. These are reccommendations for the serious photographer who wishes to get the best out of the trip, but of course some people do very well too with more simple, smaller equipment. Full frame DSLR’s are my favorite because of greater image quality (specially at higher ISOs) and usually better auto focus. Greater control of depth-of-field is also a factor of importance. Ideally you should bring 2 bodies, to be used simultaneoulsy with different lenght lenses and as a backup in case one of them fails to work. Now we come to where most people have doubts, long lenses. 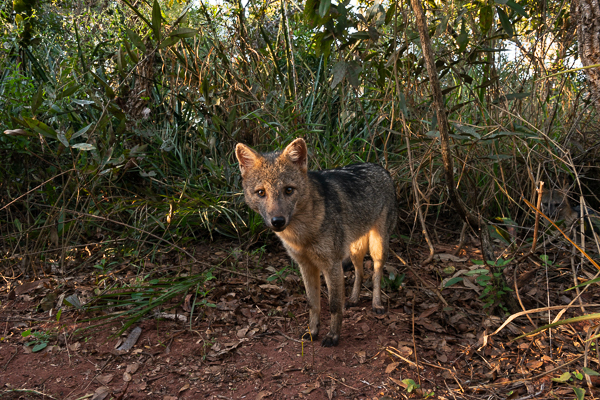 Being a wildlife photo trip, it’s natural that most attention goes to what long lenses to bring, so I’ll break down every place we visit during my Complete Pantanal Photo Tour, and what to expect so you can decide. Buraco das Araras – this is where we shoot flying Red-and-green Macaws, as well as perched ones, plus a number of other birds. Here we stay on wait on platforms located at the edge of the 100 meter deep sinkhole where these birds nest and roost. 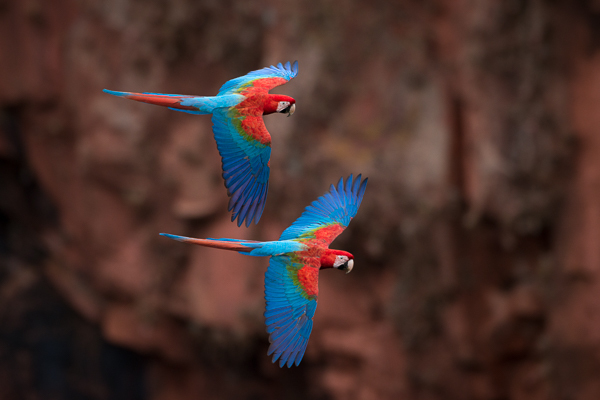 There are two situations for flight shots here – the first when the macaws fly quite far away towards the middle of the sinkhole, and where it would be best to use a long lens in the 500 to 600mm range. The other situation is when they fly relatively close to the platforms, and where a 300mm lens would be best. 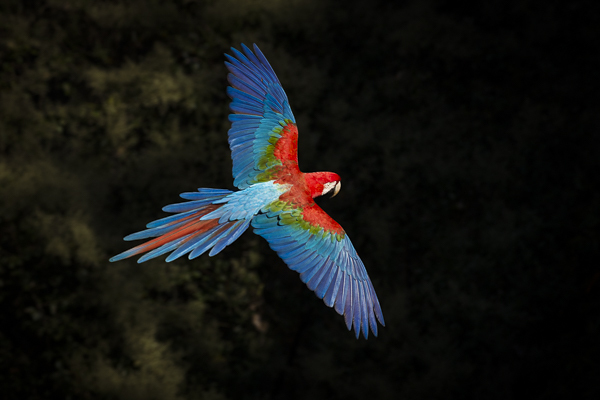 On this last situation the window of opportunity is much shorter, and you must be quite good and fast with focusing as the macaws quickly pass in front of you or even underneath the platform, so expect to shoot looking down, with the camera in hand. Sometimes the window of opportunity for perfect shots only lasts 3 seconds or so, so you must be fast. For the longer shots you will have more time to track and focus on the birds, and the lens can even be placed on a tripod with a gimbal head. Which one is easier and which one produces the best shots? Hard to say, as I have great shots from both types of situations with both types of lenses – however I’d be inclined to say that the close shots, with the shorter lens, are the most beautiful ones. I know, not great help between choosing one or two. But to be honest this is the place where you’d need both lenses to fully explore its possibilities, there’s no way around it. Fast and accurate continuous focusing is a must, so for this prime lenses are best, and used without a tele-converter, although some new high end zoom lenses are very good as well and could cover both situations pictured here. Shot with 300mm, while flying under the platform. Shot with a 600mm, flying in the middle of the sinkhole. Barranco Alto – here you will be using mostly a long lens in the 500 to 600mm range, as wildlife will usually not get super close to us. The same is true for the boat outings when shooting birds. Have in mind though that the boats here are not as large or stable as the ones we will be using in Porto Jofre, so you should be able to carry the lens well and sustain its weight for some time if needed, otherwise stick with a shorter, lighter lens. Here we also make some shots with a much shorter lens, even a wide angle, but I will cover that later on the text. 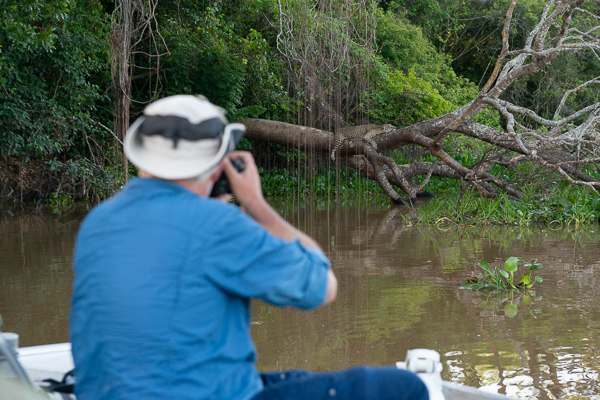 Porto Jofre – all of our photography will be done in comfortable and quite spacious boats, where we ride the rivers and channels looking mostly for Jaguars but also other wildlife like Giant Otters, Tapir and varied birds. A 500 to 600mm lens is useful for birds and also Jaguars sometimes, for example when you want a closer shot (even portrait) or when the boat is far from the action – which can also happens. On some situations we can’t get much close due to physical or ethical barriers. We do get close when there’s no risk of stressing the animal too much, but on some situations it’s best to maintain a distance of about 30 meters or so and then, unless you want a photo of the animal within the habitat (also interesting), you will need more reach. On the boat I also reccommend to keep a second camera body handy attached to a 300mm lens for when we get closer or when you want a wider shot, showing more habitat. We do get quite close to them sometimes. Have in mind, as well, that on the boat a lot of times there will be other boats around us, and sometimes you might need to stand up to get a good view. For this you need to be fast and not attached to the limitations of a tripod – a monopod is much better in this scenario and is what I reccommend to use in the boat with a big lens. Average distance for Jaguars – around 15 to 20 meters or so. By short lenses on this context I consider anything under a 200mm. The range between 100 and 200mm is quite useless in my opinion. Under this might have some use, but mostly I’d go with wide angle (24mm and under) for unique perspectives of wildlife that will allow us to get that close. This is something I have been trying to do more and more and when it works out, it definetely creates very special images that stand-out. So I’d reccommend to bring a wide angle for this. One of the situations we can count on using it is with close-up shots of caimans at Barranco Alto. Here we can lure them to very close range. A polarizer filter can also be handy if you want to cut the glare of the water surface. Another situation I sometimes try to use a wide angle is with shooting with a remote control. We leave the camera out there on a tripod placed close to the ground and wait for the animal to approach, and then shoot. This is not something easy to do and would require certain planning before, but if the opportunity presents itself during my trips, I will always try to take advantage of that for my guests. So be ready with a wide angle, a tripod and a good remote control. We may also use a short lens for night time landscape (stars) or sunsets and such. 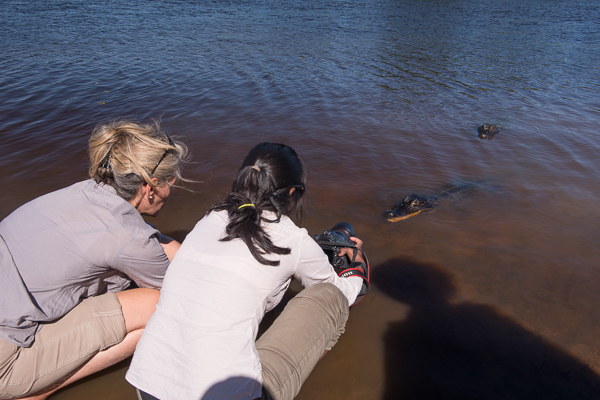 Shooting caimans with a wide-angle. Yes, we can get that close! Crab-eating Fox photographed with a remotely positioned camera, fired with Pocket Wizard remote. There is limited use for macro photography during my tours. While we do see some interesting insects and frogs at night around the lodges, it’s not anything super special really. Bring it if that’s your thing, but don’t count on very special opportunities. If you think it’s just gonna add weight to you bag, leave it at home. There can be some situations where you would like a flash, and we might do some night time photography as well – but not a lot. For such situations you would prefer a TTL flash and able to fire remotely as well. For the Jaguars we cannot use a flash, even when if would be possible – it’s a rule agreed by all other operators. So, in short, a flash can have some use, but not a whole lot. Bring enough spare batteries and memory cards. Consider water resistant cover for your equipment, specially if coming later in the season when the chances of rain showers are greater. Bring a backup hard disk for your photos, don’t count on backing up photos on the cloud – wifi connection on our lodges is quite slow due to the remote locations. This is a short list of the main equipment needed. Please contact me if you have further doubt.